In the dead of winter when you feel depressed due to bone-chilling cold with fewer hours of daylight we have some extraordinary indoor lovely leafy herbs to give you company this winter. The Indoor plants are an easy and best approach to add colour and freshness to any dull corner of your house. Growing these indoor plants as herb garden for your home or at the window shelf in the kitchen will add heavenly flavors to enhance your cooking too. In this fast-paced and technology-driven world when you have the choice to buy indoor herbal plants online sitting cozily in your recliner isn’t an awful plan to shield yourself from chilling cold. 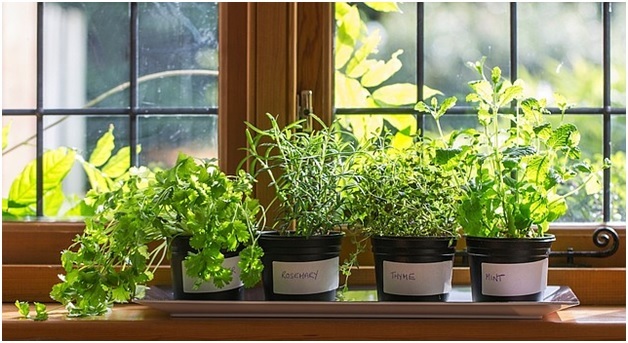 Planting these 5 fresh herbs in your house this winter is fun, fulfilling, and extremely easy. A generous source of antioxidants and tiny flavor-packed leaves of Thyme add an amazing flavor to tomato sauces, poultry, stew and most meats. Improving airflow into the lungs Thyme holds a lot of therapeutic values. Asking for little to no maintenance Thyme is also used to treat pulmonary diseases. The essential oil of thyme is used to cure inflammation & sore throat. It is one of the simple herbs to cultivate as indoor plant for home. Find more details about this herbal plant here. Mild bitter in taste yet a decent source of vitamin A & C Parsley can very well sustain in harsh climates however with a slow growth. Helping many dishes to achieve a balanced flavor parsley is a key ingredient for garnishing also. Milder winters provide it the best conditions to stay evergreen, vast and thick. Mint is an ideal herb for those who love to smell, eat and drink it with any liquid form. The health benefits of mint are amazingly unbelievable. One of the least demanding herb to grow will relieve you from headaches, acid reflux and fatigue. Drinking mint tea or mere smelling it can relieve inflammation in your respiratory channel. Exhausted following a long chaotic day? Smelling mint aroma will unwind your nerves and give a lift to your state of mind. Find more details about this herbal plant here. A herb loved by kids and can be eaten right away like a food. If you are fond of raw onions then you would really like chives too. Virtually requiring no attention, it grows well and if provided some space they love to spread out else they are impeccably happy in a small garden pot. Having delightful purple flowers is another Eco-bonus you get. A rich source of Vitamin A, antioxidants protecting human body from lung and oral cavity cancer chives are also known for anti-bacterial, anti-viral and anti-fungal properties. Find more details about this herbal plant here. This plant was used widely as a Christmas plant until 20th century. This hearty herb of winters can be used in many innovative ways to elevate your culinary skills. A distinct and powerful aroma is perfect to diminish the feelings of anxiety and brings relaxing effects. Although it requires a little pampering of supplemental light to stay alive in winters but this flavorful harvest with ample of health benefits is worth growing indoors. You may explore more details about this plant here. All these indoor herbs want a little care and attention to return us a bountiful of wishes for a happy and healthy life along with adding a charm of freshness to your home.